Like other regions in the world, there are an increasing number of people in Hong Kong suffering from non-communicable diseases (NCD) which caused ill-health, disability and premature deaths. With an expanding and ageing population, the burden of NCD in Hong Kong is expected to increase further. Recognising that there will be significant health, social and economic impacts on our population if the problem of NCD is left uncontrolled, the Government is committed to fighting against NCD on all fronts and alleviating its burden. Since 2008, the Government has launched a strategic framework to prevent and control non-communicable diseases (NCD) and has set up a high-level Steering Committee (SC), chaired by the Secretary for Food and Health and comprising representatives from the Government, public and private sectors, academia, professional bodies, industry representatives and other key partners, to deliberate on and oversee the overall roadmap for implementation. Three working groups were set up, with two focusing on promotion of healthy diet, physical activity and reduction of alcohol-related harm. To combat the threat posed by NCD and in line with the World Health Organization (WHO)’s “Global Action Plan for the Prevention and Control of NCD 2013-2020” (Global NCD Action Plan), the SC, in 2018, formulated and endorsed a strategy and action plan for prevention and control of NCD by 2025 which defines a set of 9 local NCD targets to be achieved by the same year. This resulted in the publication of the document, “Towards 2025: Strategy and Action Plan to Prevent and Control Non-communicable Diseases in Hong Kong” (SAP). 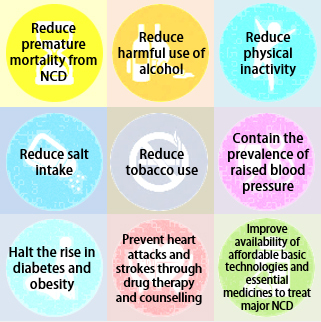 Aligning with the WHO’s Global NCD Action Plan, the SAP focuses on four NCD (namely cardiovascular diseases, cancers, chronic respiratory diseases and diabetes) and four shared behavioural risk factors (namely unhealthy diet, physical inactivity, tobacco use and harmful use of alcohol) that are potentially preventable or modifiable and have significant impact on population health. The SAP aims to reduce NCD burden including disability and premature death in Hong Kong by 2025. “ Lazy Lion” performed Flash Mob in ”World Kidney Day” and at Kowloon Park on 10 & 31 March 2019 respectively with the members of the public to let them savor the joy of physical activity. “ Lazy Lion” disseminated towels as souvenirs to the participants and encouraged everybody to “Move for health every day”.